This welder/generator combination is housed in a wheeled frame for easy portability, a lifting point, cable coiling points and welding rod holder. The ideal power tool for farmers, construction, artisans and mobile workshops. 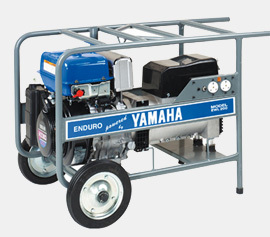 The legendary Yamaha MZ360-K2-50 engine is coupled to a Sincro welder/alternator end producing world-class power for when you need it. The ability to select from between 60 and 200 amps max welding current makes it one of a kind. Coupled to a powerful welder capable of between 60 to 200 amps max welding current.